How many accounts on Facebook are fake? Recent estimates of half could be low. Here’s an experiment: open a Facebook account with a name that cannot possibly be anyone else’s real name, for example, Johns XQR Citizenry. Solicit a few real people to friend you, start posting something original every day and see what happens. Eventually, your friends will inform you that “Johns XQR Citizenry” solicited them to friend him, even though they’re already friends with you. Congratulations, your Facebook identity has been cloned. When you do a search, you find a half-dozen “Johns XQR Citizenry,” and every one of these cloned accounts is completely empty: no photo, no content. They were obviously set up for the sole purpose of cloning your identity to propagate spam to your friends list and then their friends’ lists. So you flag the clone accounts as per Facebook’s instructions, and the (automated) response comes back “the account you flagged does not violate our community standards.” So in other words, cloning identities on Facebook is just fine. Next, you try to find some way to report the cloning to Facebook–there’s isn’t any way. How difficult would it be for Facebook’s vaunted AI screens to identify cloned accounts? Same name, empty account, delete, block the IP. How hard is that? Then you start getting friends’ requests from fake accounts: accounts with a photo of a supposedly legitimate person with a photo or two of a sunset for content and that’s all. Add up the clone accounts and the fake accounts, and one wonders if the total number of fake accounts is more than half of all Facebook accounts. The question that naturally arises is: what’s Facebook worth if half or more of its 2.2 billion accounts are fake? What’s Facebook worth when it can’t even weed out the most obvious cloned and fake accounts? What’s it worth if perhaps it doesn’t want to eliminate all those fake accounts? This raises another question: how can any social media company verify a “real identity” from a fake identity? The only way to do so is to institute a process much like opening an online bank account, a process that requires identification, deposits into an existing account and so on. 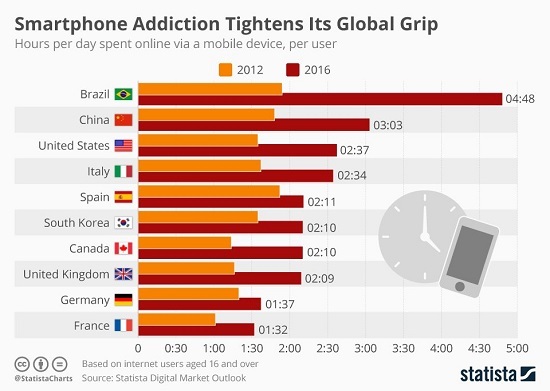 Many people conflate an addiction to screens with an addiction to Facebook.People are indeed addicted to their smartphones and related screens, but that doesn’t mean they’re addicted to Facebook. The social media space is absolutely ripe for a new entrant who demands arduous verification and constantly monitors its user base to eliminate cloned and fake accounts. The number of “real” accounts in such a network would be a fraction of the existing debauched networks, but then users could actually trust that network. Advertisers would finally be able to trust that their millions of dollars in spending isn’t going mostly to click-fraud farms. Thank you, Susannah W. ($100), for your outrageously generous contribution to this site — I am greatly honored by your steadfast support and readership. Thank you, Steve W. ($50), for your monstrously generous contribution to this site — I am greatly honored by your steadfast support and readership.